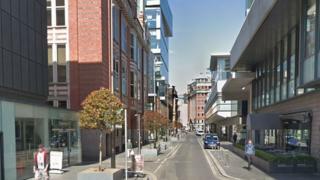 A man hit by a lorry in Manchester city centre during the morning rush hour has died, police said. The pedestrian, in his 50s, was taken to hospital but died following the 09:20 GMT collision on New York Street. A police spokesman said officers were "currently working to update the man's family" and the street remained closed while an investigation took place. The collision is believed to have happened near the Grill on New York Street restaurant.